ROSEMARY: Actually, I'm not just going in my mind, I'm going in an American Airlines big old plane - don't ask what kind, I never know - and I'm going with Stefanie Pintoff and Jane Cleland. 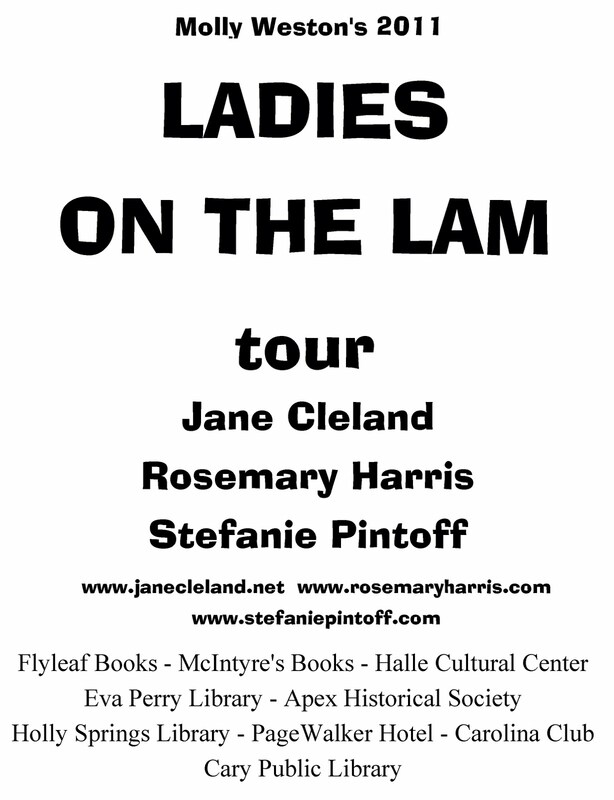 We are embarking on Molly Weston's 2011 Ladies on the Lam Tour. And Molly, who one day will officially be anointed the patron saint of mystery writers, does an amazing job keeping our dance cards full with appearances at libraries, bookstores, cultural centers and women's groups with the occasional side trip to Replacements (more on that tomorrow for the china and tea set lovers) and the wonderful daylily farm that she and her husband own. This year we'll also be visiting the exclusive Carolina Club. Last year I was lucky enough to be a part of Molly's Unarmed But Dangerous tour with Elaine Viets, Donna Andrews and Meredith Cole. Roberta mentioned that it's good to tour with other people and I've been very fortunate to have toured with some of the most generous, most fun people in the mystery community. BTW there really is a James Taylor Bridge in North Carolina and apparently the sign keeps getting stolen. 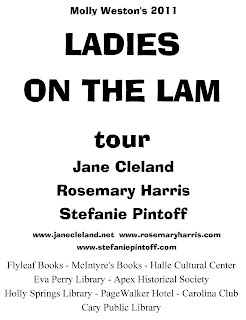 Ladies on the Lam will be an opportunity to speak to hundreds of readers (always good) but even more important it will be an opportunity to bond with other writers, drink sweet tea, eat fried okra and pimento cheese (I'm still not sure what's in it) and talk books. For three years it's been one of the highlights of my book tour - last year's dinner at Margaret Maron's will be hard to top but I know Molly will try! What have your most memorable tour experiences been? And who would be on your fantasy tour? Oh, easy question, Ro. My fantasy tour is the Jungle Red Tour! Wouldn't that be hilarious? We could go to Morth Carolina, of course, with the amazing Molly. Then west to see Lesa Holstine, and then....well, you all pick it up from there. Wouldn't that be wonderful! We'd need a van (a VW bus??) -- or maybe a limo. Ro, your trip sounds fabulous. I love touring with other writers and Molly Weston sounds like a genius. Replacements? Can't wait to hear. Jungle Red Tour, for sure! Wouldn't that be fab? Favorite tour ever? That's a hard one. But years and years ago, when we were all barely fledged writers, I did a tour of the Midwest with Steve Womack and Barbara Shapiro. We paid for everything ourselves, rented a car, had t-shirts made, stayed in crummy hotels, and had a fantastic time. And a couple of years ago, as part of a bigger tour, I drove across Iowa, Nebraska, and Kansas, as there was no easy way for the publisher to book flights between the stops. It turned out to be one of my best experiences. Great bookstores, new friends, and oh, those Iowa skies. Marvelous. PS Would love to do Molly's tour, too! My favorite tour was definitely our last trip to North Carolina, Rosemary! Nine events in four days... Tiring (and hot) but lots of fun. Have a wonderful time and post lots of pix! I have yet to tour. (this may explain a lot.) It looks like fun. Have a blast, you guys. 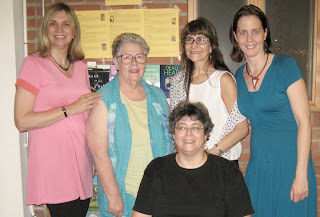 I just returned home from my first book tour. It was great fun as well as exhausting. I cant imagine how much fun it would be to go cross country with the Jungle Reds!